Leonie and Amelia-May have been writing independent sentences in free flow time and creating their own maths stories with adding and take away. Evie has been trying really hard with her phonics and writing and has made very good progress. Jenson has taken risks by writing labels for his picture and using the sounds he can hear in words. Jake has persisted in doing his zip up independently. 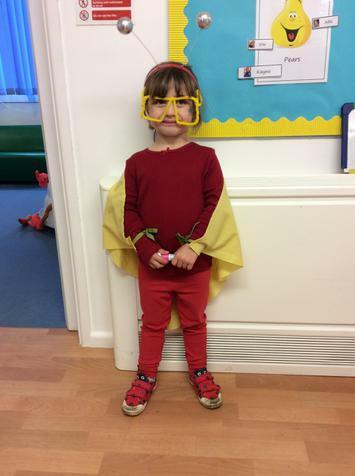 Our Superpillar focus this term is Scarlett. Scarlett takes risks and she keeps on trying even if things get difficult so we are going to try to be more like Scarlett. Jenson sat beautifully in singing assembly and avoided being distracted. Harmoney found it difficult taking off her apron but preserved and eventually worked out she could take it off in a different way. Ava was persistent with writing p and even though she found it difficult at the beginning she kept on trying and trying, until she formed a perfect p .
The superpower we are focussing on this half term is Shadow and the children's target is to "respect others by listening carefully and thinking about others feelings. " Alfie was very kind to a child who had broken his Humpty Dumpty by accident" it's alright I can make another one , " he said. Dougie for including someone in the hugging game. Freya helped Dougie to clean up milk on the floor. Freya for helping other children during forest school. Jake for comforting others when they are upset. Rio offered to help Dougie. Lily-May asked Elsie if she would like an apple as it was the only one left. Ava shared her playdough with Lara. Issabella kindly shared her play dough.